It is estimated that 1 in 7 North Americans have a tattoo. Of those individuals, 1 in 5 have reported having tattoos that they would like removed. Laser tattoo removal is a long and complicated process. Whether it’s the name of a former flame, or a tattoo that simply no longer appeals to you- laser tattoo removal is becoming as mainstream as tattoos themselves. Current technological advances enable consumers to decide between complete removal, or a partial removal. 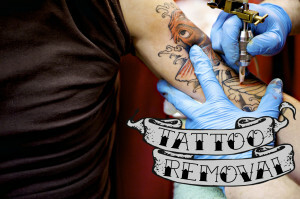 A partial removal is beneficial for those looking to get a cover-up tattoo on top of their current undesirable ink. Despite the abundance of products on the market claiming to offer tattoo removal, lasers are the only effective method of removing a tattoo without causing permanent damage to the skin. Aggressive techniques like salabrasion tattoo removal, the process of removing unwanted ink via dermabrasion with granular salt and water, is often ineffective with a high risk of scarring and infection. Bleaching creams have also shown to be ineffective, and ultimately make removal with lasers more difficult. Laser tattoo removal refers to the process of using a laser with a wavelength capable of targeting the ink particle in a tattoo. The body then absorbs these broken up ink particles, resulting in fading. Over time and with multiple treatments, tattoos can often be completely removed from the body. Q-Switched lasers are the most common lasers used in tattoo removal. Their energy is delivered in nanoseconds and is effective on a large spectrum of colors. For more information on laser tattoo removal with the PicoSure machine, please submit an inquiry via our contact form. All consultations are complimentary. Please note that all appointments require advanced booking.